All Options Remain On The Table. In a careful scholarly manner, as I approach any investigation including the 1892 true crime at the Hotel del Coronado in Coronado Mystery, I keep all options on the table and approach my conclusions in a carefully nuanced, statistical manner. Unlike conspiracy paranoiacs, who are convinced of some extreme and dramatic story, I carefully lay out the odds as best possible. As an MBA type, I am trained to place numbers on the board, starting with whatever statistics are at hand, with the clear plan not to publish until I have reached some credible conclusions (never 100%, but always guardedly and carefully hedged). As always, and just so in the case of MH370, I have pondered the situation and found additional murky suggestions of possible coverup or collusion, which I mention without committing. Lemma 3 My Choice. 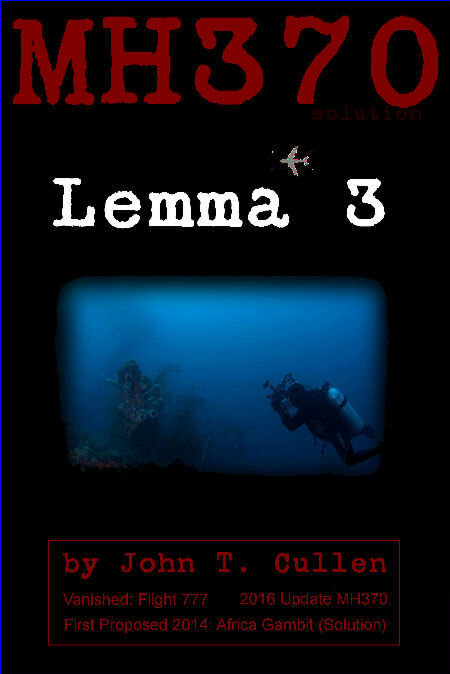 Mainly because the first two Lemmas in the case are so weak, I have leaned strongly toward Lemma 3 from the start (hijack with intent to weaponize and cause another 9/11 type event). The more the authorities failed to adequately pursue this leg, the more I have felt obligated to keep it (all options) on the table. My conclusion (Lemma 3) is that (most likely) the plane was hijacked by terrorists, with certain national intelligence services behind them, to be flown to a secret based on the lawless Horn of Africa, to be weaponized there. It would become a horrific bomb to be dropped on a major target for propaganda purposes, causing maximum death and cultural destruction. The guilty countries would never need to claim responsibility, but would let the usual wild-eyed fanatics take blame. Ultimately, the purpose would be to kill the myth of Western power in the eyes of billions of Third World citizens and turn them toward the radical, murderous doctrines of tyrannical regimes and religious sects (Muslim extremists like Daesh). January 2017 Position. My position is stronger than ever that the hijack (which I believe it was) was not carried out simply by a few wild-eyed fanatics. There is a sense of sophistication (despite ultimate failure) about the affair. For example, I have to think that a decoy plane might have carried instruments south along the path later found (hacked? Putin's specialty? he's not the only) on Captain Shah's home computer. Please note: if you see the strange detour taken by Captain Shah in his last hours, which I have noted on this website among other amazing findings, you have to feel your skin crawling with the untold background of this story. Please, read my website and books with an open mind. The novel was a quick dramatization, meant to entertain as well as edify. It is not meant to be read literally, but simply as one possible way to execute Lemma 3. Short Bio: John T. Cullen, a San Diego Author. I offer this information in the spirit that I have worked hard in the service of truth as a writer, traveler, and researcher. My credentials and degrees include a BA in English (University of Connecticut, Storrs); BBA in Computer Information Systems (including a minor in Accounting and Finance, National University in San Diego); M.S. in Business Administration (Boston University). I am an Active Duty veteran of two enlistments in the U.S. Army, during which I spent five years stationed at a major logistics command under USAREUR in West Germany. I have lived in multiple countries, speak several languages, have dual citizenship (U.S. and Luxembourg, therefore also European Union). Among my writings, I have translated Goethe's Faust (I) from German into English, as well as Rainer Maria Rilke, Paul Verlaine, and many others; as well as Classics Major bits from Virgil, Ovid, Catullus, Caesar, Cicero, and more. I write novels under the pseudonyms John T. Cullen (thrillers), Jean-Thomas Cullen (my birth name; special projects of largely sentimental value), and John Argo (suspense, SF, historical fantasy, historical fiction). I write nonfiction under my English-language daily handle, John T. Cullen. I'll mentioin at least one other of my several SHIPS projects (Secrets Hidden In Plain Sight, like the MH370 enigma): my scholarly analysis (Dead Move: Kate Morgan and the Haunting Mystery of Coronado; and the noir 1890s period novel closely based on it, Lethal Journey. To read about the 1892 true crime and resulting famous ghost legend surrounding the Hotel del Coronado near San Diego, see another special website of mine: Coronado Mystery.